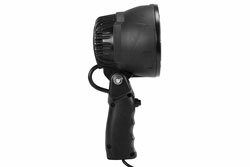 The HUL-LED25WRE-CPR-TRP handheld spotlight from Larson Electronics carves a brilliant path through even the darkest of nights. This unit combines high output Cree LEDs and a 120mm parabolic reflector to deliver a powerful 2,000 lumens with a focused beam reach of over 1,000 feet while drawing only 25 watts of power. An articulated light head gives operators precise control over the beam position. Equipped with a choice of trailer plugs, this IP65 rated waterproof spotlight is ideal for hunting, camping, marine and boating use as well as for first responders and emergency services. 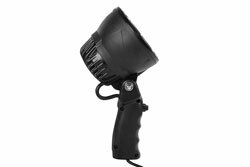 Light Features: The HUL-LED25WRE-CPR-TRP handheld spotlight delivers an impressive 2,000 lumens while drawing only 25 watts of energy. With a combination of high output Cree LEDs and a 120mm parabolic reflector, this spotlight projects a tightly focused cool white beam reaching up to 1,000 feet. This beam clearly and sharply illuminates objects all the way to the end of the beam reach. The Cree LED units in this light have been chosen for their high lumen per watt ratio and extreme longevity. These Cree LEDs generate 80 lumens per watt effective lumen output and have a 70% lumen retention at 50,000 hours, giving them better efficiency and operational life than traditional light sources. 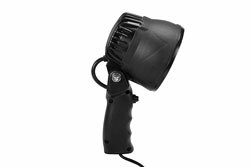 This IP65 rated spotlight features an ultra-durable ABS polymer body, an aluminum alloy light head housing, and an impact resistant polycarbonate lens. Waterproof, dustproof, and shockproof, the HUL-LED25WRE-CPR-TRP is built to work hard and survive demanding outdoor use. While the HUL-LED25WRE-CPR-TRP is built to withstand rugged use and harsh outdoor conditions, comfort and ease of operation haven`t been sacrificed. This unit is ergonomically designed for balanced and comfortable handling. The HUL-LED25WRE-CPR-TRP features an articulated light head that can be tilted up and down independently of the handle for more precise beam positioning. The nylon handle has a no-slip textured surface that ensures a firm grip even in wet conditions. The booted push button provides additional protection from dust and water and is conveniently placed to allow operators easy forefinger access to the switch for quick on/off action even while wearing gloves. The image on the left shows a long, dark road similar to a long corridor, illuminated with nothing but moonlight. The image in the middle is the same road, now being illuminated with the HUL-LED25WRE-CPR-TRP; The image on the right shows the HUL-LED25WRE-CPR-TRP illuminating a dark warehouse. This spotlight provides a tight, circular spotlight at several hundred feet. Each HUL-LED25WRE-CPR-TRP Spotlight comes with a detachable 16 foot coil cord with trailer hitch plug. 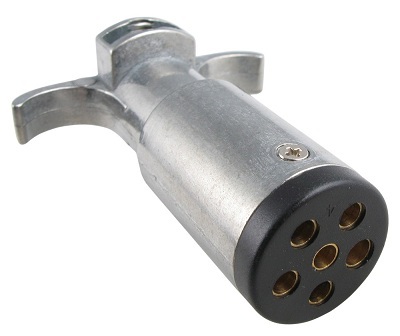 Plug options include: 4-pin flat connector, 4-pin round connector, 6-pin round connector, 7-pin round connector, and 7-pin flat connector. 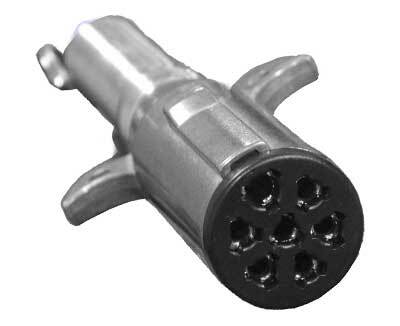 (Please note: the exterior housing on both 7-pin flat and 7-pin round connectors are physically round, the pins are either flat or round). The cord is detached via a weatherproof, 2 pin Deutsch connector which easily and securely attaches and detaches the coil cord from the spotlight. Other cords, including 21 foot cords with ring terminals (C-21RT), 16 foot cord with spring battery clamps (alligator clips) (C-16BC) and a 16 foot straight cord with cigarette plug (C-16CP) are available. This light can be ordered in either 12 volt or 24 volt configuration, allowing it to be used with any vehicle or ATV equipped with a cigarette plug. Choose voltage below when ordering.